Shueisha's Weekly Young Jump magazine will announce in its tenth 2017 issue, to be released on February 2, that manga Keppeki Danshi! Aoyama-kun (Cleanliness Boy! 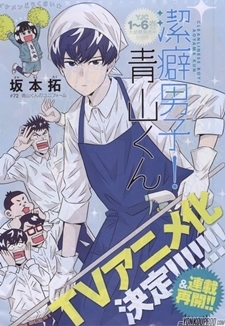 Aoyama-kun) will get a TV anime adaptation. A countdown site by Shueisha and Pony Canyon opened last week and is scheduled to end on Thursday. The gag manga is written and illustrated by Taku Sakamoto. It was initially serialized under Miracle Jump from June 2014 to October 2014 and then in January 2015 was transferred and continued in Young Jump. The manga has six compiled volumes, and the seventh volume is scheduled to be released on February 17, 2017. The story revolves around Aoyama, a fastidious soccer genius who prioritizes cleanliness over everything, in which during his plays he neither heads nor slides and only throws with his gloves on! Usually im pretty meh when it comes to soccer animes (specially since Days) but i could give this one a shot ! Found this oddly interesting. At first, I thought of Sakamoto desu ga? after looking at his "cool poker-faced look." Anyway, if you're interested as well, feel free to read a preview of the manga in Japanese here. Will watch! :D Sounds a bit different. Oh yeah I was hoping for kaguya sama adaptation when young jump teased an anime adaptation but whatever lol. Lol the synopsis made me laugh, was reminded of Sakamoto desu ga? and Handa-kun just from the cover, but that synopsis made this seem interesting on it's own. Hopefully it'll be good. I was hoping for that too. Who knows, we might get one in the future! That and Grand Blue adaptation, after that I can die peacefully. Kaguya is pretty popular so I expect something this year. I'll put this on my list and get the fist volume of the manga by tomorrow - so I can make my own image of this series. Looks interesting. But not really sure. Doesn't look that bad, but not my type of series. Seems more aimed towards the fujos. I hope this wont be as boring as Sakamoto Desu ga? Totsuka route is the way, Hachiman! OT: comedies are hit or miss, so I'm gonna give it a shot, the synopsis doesn't sound bad. Instead of adapting Kaguya-sama we get more fujoshit. [The gag manga is written and illustrated by Taku Sakamoto. Is this some new meta joke? Jokes aside, I do hope this doesn't turn out to be boring like Sakamoto that overstayed its welcome with 24min of one gag all over again. This might have some potential, hope the comedy will be good. The synopsis sounds hilarious. So kinda like if Levi were to star in a comedy series? Looks really good, time to read the manga. The countdown site has been opened and this is the image that has been revealed.